Step 1 Select “Supplier” from pull down and the system will automatically retrieve some common data such as Contact, Fax No, Tel No, Address, Term and Currency. Once the Purchase Orders have been added, it will appears as follows (Fig. 3). 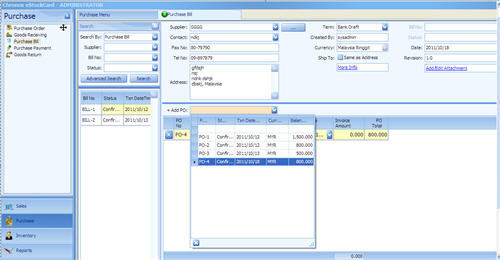 Step 3 Additional information such as Supplier Invoice No & Invoice Amount has to be entered at each of the row. This is because the actual invoice amount may differ from PO amount. Bill Amount is the summation of each individual Invoice Amount. 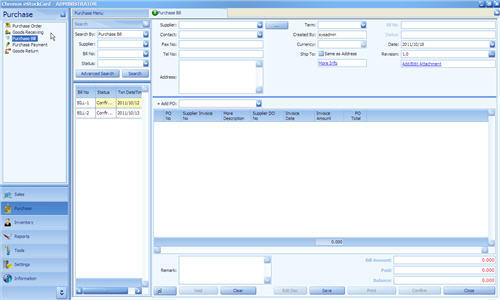 Step 4 Click “Save” button, system will assign a unique Bill number and the status of the Bill will be changed to “Active”. You still can amend it as long as the status of the Bill is “Active”. Step 5 If everything goes fine and please proceed to click “Confirm”, the status of the Bill will change to “Confirmed”. No reversible can be done in later stage if the status is set to “Confirmed”.